Some where in early October, we went to A Wet Thai again for dinner. This round, I had their Crab Meat Fried Rice. Very delicious. 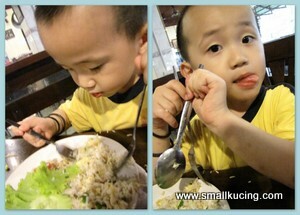 Papa and Mamarazzi had plain rice with some vegetable. And Mamarazzi's must have ..."Kerabu Kaki Ayam"
Since both Papa and Mamarazzi didn't feel like having poultry, oink oink nor fish, the lady that took our ordered suggested Grilled Sotong. MMmmmm..surprised at the size of the Grilled Sotong. Both of them love it very much. Taste exceptionally good when dipped in the Cili Sauce provided. 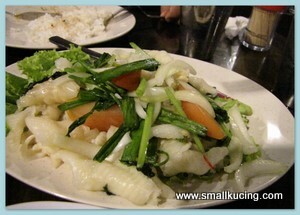 Will certainly come again for the Grill Sotong. Here is their address if you wish to have a try at the Grilled Sotong Address : No.1, Grd Floor Jalan Puteri 2/5, Bandar Puteri, 47100 Puchong. Tel: 603 - 8060 5630. 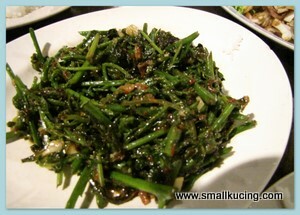 Oooo...the kangkong!!! Oooo...the sotong!!! Oh no...the kaki ayam, no...thank you very much. Muahahahaha!!!! 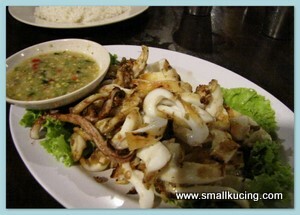 oooh, i love that grilled sotong too, and nice if dip into the thai chili sauce.. Tempting and another round of my kind of food, the kerabu kaki ayam and the veg though I don't fancy grilled sotong so much and I hardly cook it at home too. I want to try the Kerabu Kaki Ayam - it looks really good!